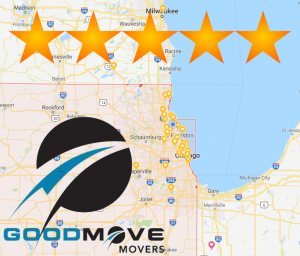 Good Move Movers is ranked among the best of Hinsdale Moving Companies with an average customer quality rating of 4.9 out of 5 stars from hundreds of reviews. Their skilled and experienced staff in the Hinsdale area can help you with your upcoming move. Licensed, insured, and accredited with the Better Business Bureau, If you’re planning a commercial or residential move, we’ll provide you with a free estimate before you sign any type of contract. So, if you’re moving from Ayres Avenue or Hickory Street , or anywhere in 60521-60523, make you next move, a good move. While many Hinsdale residents commute to jobs scattered throughout the Chicago metropolitan area, Hinsdale is also the home of many small and medium-sized businesses. Meadowlark Golf Course is located in Hinsdale. Other businesses include Trumeau Design & Decor, Salt Creek Club, Divine Providence In-Home Care Services, Walt Denny, Inc, and ANI Incorporated, BAMtheatre, along with various other small and medium-sized businesses. Non-profit organizations such as Hinsdale Historical Society and Hinsdale Humane Society are also based there. Hinsdale, IL Local Moving & Storage Good Move Movers is ranked among the best of Hinsdale Moving Companies with an average customer quality rating of 4.9 out of 5 stars from hundreds of reviews. The Hinsdale Good Move Moving and Storage location is proud of our 5 star reviews and Awards for the past 3 years. Our availability to customers in Hinsdale, IL has been well received; we thank our customers for their positive comments and referrals. Are you looking for a local moving company in Hinsdale or DuPage County Illinois?? If you are in Hinsdale or any of the other towns in Dupage, Lake, or Cook counties, schedule a meeting with or call us today! The past five years has seen a steady growth in real estate and of moving companies in Hinsdale, IL; we are rated highly and voted as one of the best moving and storage companies in 2015, 2016, and 2017!